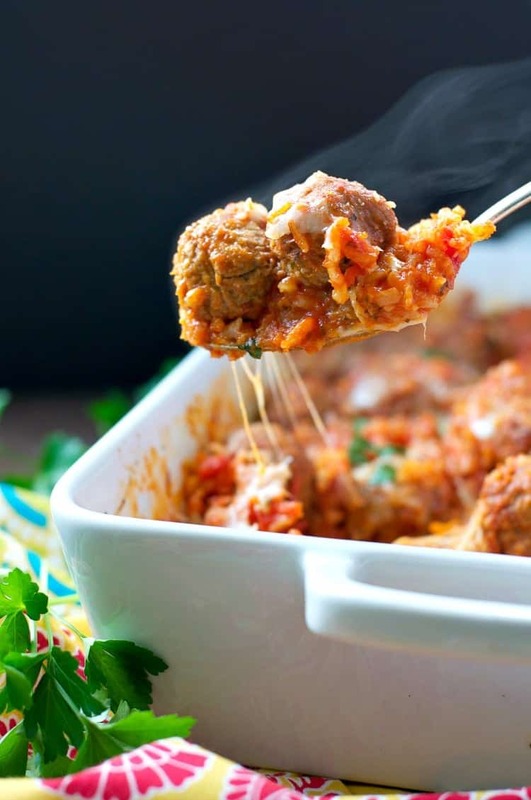 A zero prep and incredibly comforting Italian Meatball and Rice Casserole made with a few simple ingredients. This meal is super easy and effortless! 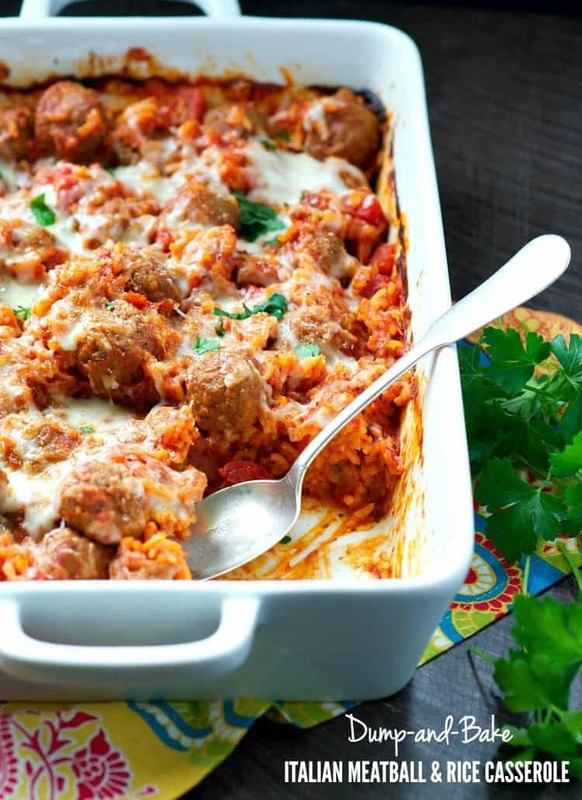 There’s no prep necessary for this Dump and Bake Italian Meatball and Rice Casserole! It’s the perfect easy dinner solution for your busy weeknights – and your family will love the cozy comfort food! I’m sure that I’m not the only one who finds it incredibly important, but also incredibly difficult, to serve a home-cooked meal most nights. Not only do I like to be in charge of the ingredients that my kids are consuming, but I also like to spend that small amount of time together as a family. Even when my toddler only sits at the table for 5 or 10 minutes – it’s better than nothing! 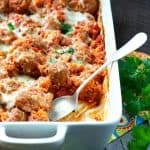 Easy dinner recipes like this dump-and-bake meatball casserole are my favorite way to get a quick supper pulled together when I don’t have a lot of time. Because homework, soccer practice, and two-year-old temper tantrums always seem to get in the way of my elaborate cooking dreams! 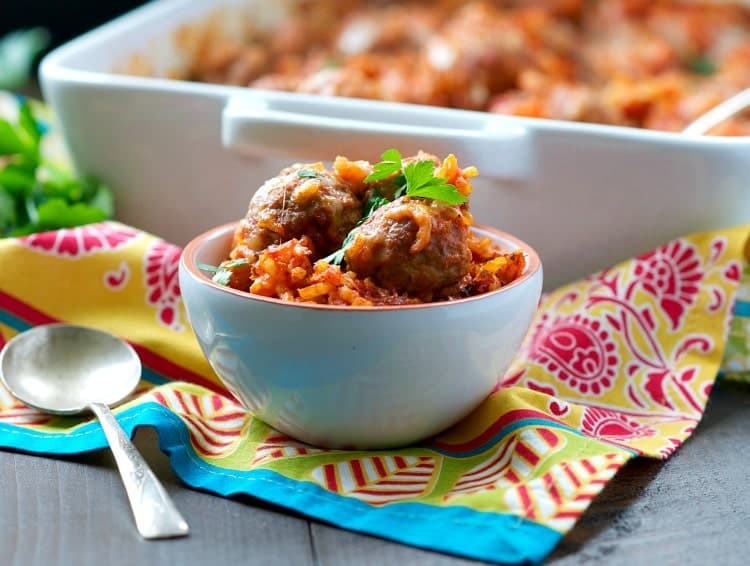 With help from delicious prepared ingredients like these fully-cooked Rosina Italian Style Meatballs, a cozy, kid-friendly dinner is ready for the oven in about 5 minutes! Even with my crazy schedule, I can manage this one! 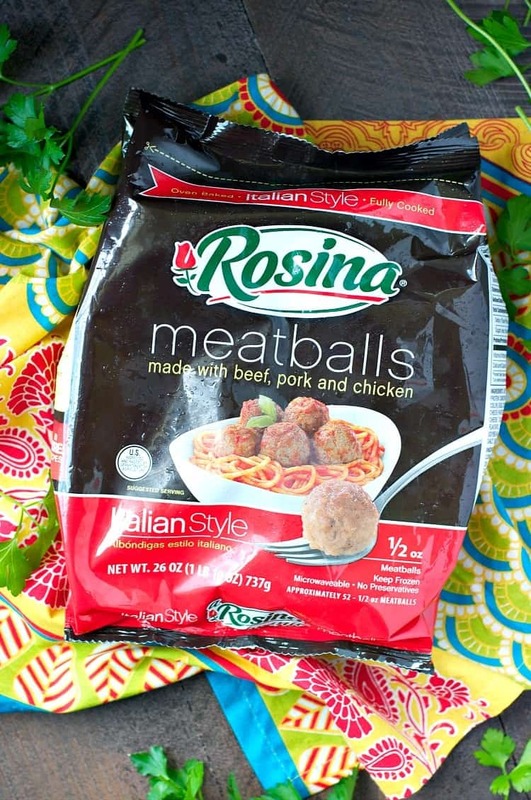 The Rosina Italian-Style Meatballs have a great, authentic taste, and they’re incredibly versatile. 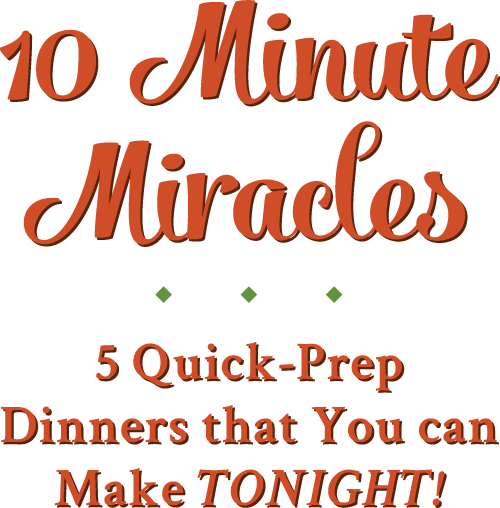 I can pick them up at Walmart on my regular grocery run and keep them in the freezer for last-minute meals – whether I want to toss them in a slow cooker, serve them over pasta, or add them to a soup. For this particular dish, I don’t even need to thaw them first – PERFECT for the days that I fail to plan ahead (and there are plenty, believe me)! 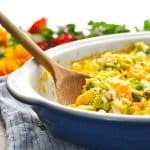 I recommend using long grain rice for this recipe such as Basmati or Jasmine rice as it creates a creamy and comforting texture but still has a bite to it. You could also use a risotto rice such as Arborio but the dish will be much creamier and softer in texture. Since the rice bakes slowly in the dish, it absorbs TONS of flavor from the marinara sauce. It also becomes thick and creamy – a lot like risotto, which also cooks slowly to draw out the starches in the rice. This is so much better than risotto, though, because there’s no need to stand at the stove and stir a pot for ages! If you have picky eaters in your house, this is sure to be a crowd-pleaser. The classic Italian flavors come together in a fun, kid-friendly dinner that’s also easy for Mom! Stir marinara sauce, tomatoes, water, and rice together in a 13-inch by 9-inch baking dish. Add meatballs and stir to combine. Cover the baking dish tightly with a lid or foil. Bake for 60-75 minutes or until the rice is tender. During the final 5 minutes of cooking, remove dish from oven, uncover, and sprinkle with mozzarella and Parmesan. Place back in the oven (uncovered) for the final 5 minutes, or until cheese is melted. Want to try this meal? You can keep up with Rosina Food Products, Inc.® on Facebook, and you can also save $1.50 with a coupon at Walmart! You always make the best casseroles, Blair! Love this meatball version. 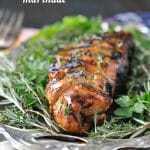 My husband would devour this in no time! Wow ! Meatballs and rice that’s what I need now 🙂 The casserole looks amazing, Blair ! Thank you, Ruwani! Total comfort food! Oh my gosh! This looks amazing, Bair. 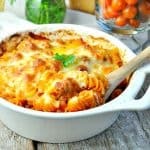 I love the photo of the steam coming off the casserole!! It makes me want a bowl right now. I’m all about no prep. You know easy is practically my middle name when it comes to cooking. Your pictures look amazing as always! Thanks, Megan! And I agree — EASY is the only way to go! are these meatballs GF? PLEASE say yes! cause I NEED! haha love this dump and bake. You are so creative! I think that Rosina does have a gluten free version, Lindsay! Definitely keep your eye out for them!! Thanks so much for the pin, Michele!! would love to make this recipe, but it really has too much sodium. 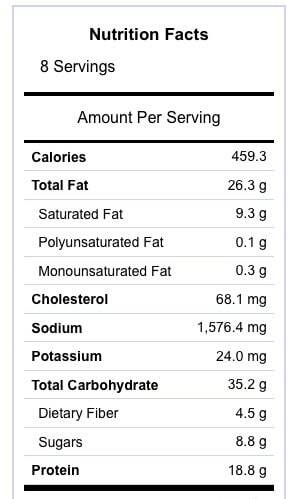 I see no reason why you couldn’t use all “low/no added-Sodium” ingredients to make this casserole. Do you cook often? Hi, Rose! I don’t think so. Brown rice takes a lot longer to cook than white rice, so it likely wouldn’t be done in time. You could probably use a par-boiled brown rice (like Minute Rice) since it’s already almost completely cooked. I’m just not sure how that would affect the amount of liquid in the dish. Hope that helps, and let me know if you give it a try! I just made this after trying another failed recipe online and this turned out great!! I love it! So glad I came across this recipe, absolutely a keeper!! Has anyone used couscous to replace the rice? Hi, Amy! No, I haven’t tried couscous in this recipe. I have some picky eaters that wouldn’t like the diced tomatoes. Would I need to add about a half or cup of water to make up for the liquid in the can and then just flavor as necessary? Could I use aborio rice instead of “long grain white” ? Hi, Hollie! Yes, the basmati should work fine as an equal substitute since it’s a similar long grain rice. Enjoy! Could I use fresh uncooked meatballs as a substitute? Hi, Haley! It depends on the meatballs. If they’re small enough to cook through in the time that it takes your rice to cook, that should be fine. The other consideration is the type of meat that you use in the meatballs. If they’re going into the dish raw, then you want to make sure that you’re using an extra lean ground meat (ground turkey breast or extra lean ground beef would be best). Otherwise, the meat will make the casserole greasy as it cooks because you won’t be able to drain the grease from the dish. 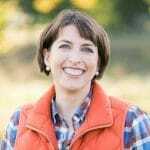 Have never before commented on a blog but wanted to leave my feedback for you. I stumbled across this recipe after planning to make spaghetti and meatballs and realising I had no pasta but plenty of rice. My kids LOVE LOVE LOVED it! Tuesday is traditionally take away night because I am too busy to cook but this will be our Tuesday night go to. FYI we are in Australia. I used a jar of dolmio tomato and basil pasta sauce in place of marinara sauce and used the pre rolled frozen (uncooked) Italian style meatballs from the butcher section at Woolies. I added some zucchini and capsicum but followed all the other instructions. Honestly easiest thing I have EVER made thank you! Hi, Mel! Thanks so much for letting me know! I’m glad that it was a hit and that it made your life a little bit easier. 🙂 I have tons of other similar dump-and-bake recipes on the blog, so feel free to use the “search” bar to find other ideas that your kiddos might like, too! I found this on Pinterest over the weekend and it’s in the oven right now! I added some fresh spinach to try and sneak some veggies in so my kiddos would eat it without thinking too much of it, so hopefully that won’t affect things too much! It smells so good right now and I can’t wait to try it! 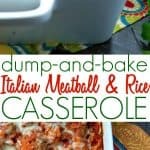 I wish I had found your site sooner – these dump and bake recipes are going to be a lifesaver!! 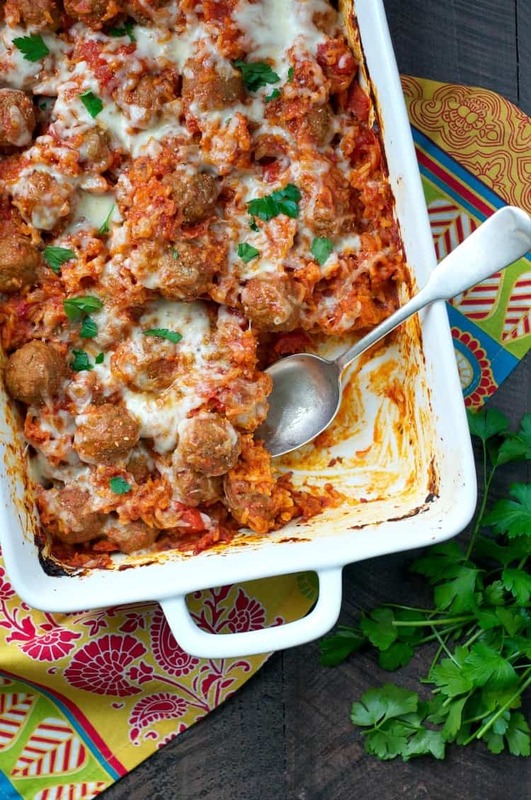 Can you substitute the meatballs for homemade ones? Could I put a part of his together and freeze it before baking it? 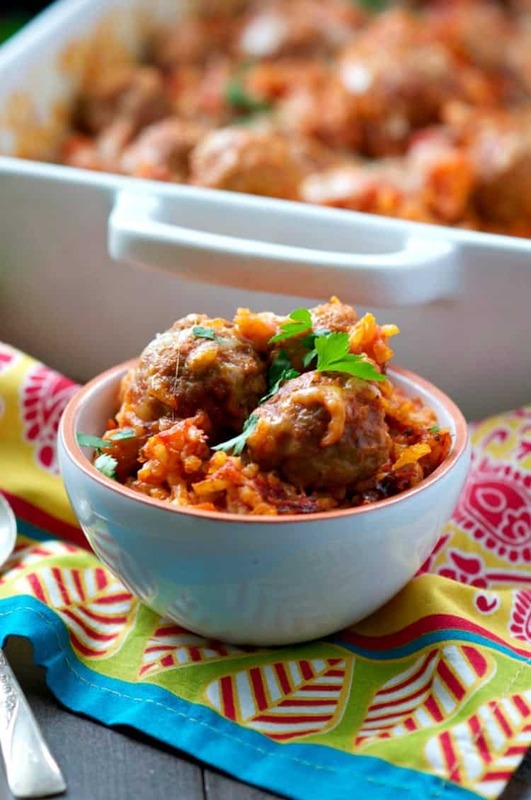 I have never frozen anything no with rice before….I ask because I’m going to a freezer Melanie making party and need gluten free dish ideas .. this looks like a good candidate as long as I buy gluten free meatballs. Hi, Jentri! 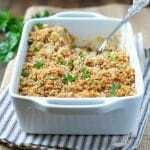 Unfortunately, raw rice does not freeze well in casseroles, since it breaks down and loses its texture. You can certainly assemble and freeze anyway — just be aware that the rice may be a bit mushy after thawing and baking.